The Cruel Prince didn't turn out to be the five-star read I was expecting. But it was close. A mix of ACOTAR, Game of Thrones and Scandal, it was one of my most anticipated reads of 2018. Still, it was still a lot different from what I expected. Maybe it was how light on romance and high on scheming and betrayals it was. Maybe it was my lack of experience with anything Holly Black. Whatever it was, it was different--but still pretty amazing. 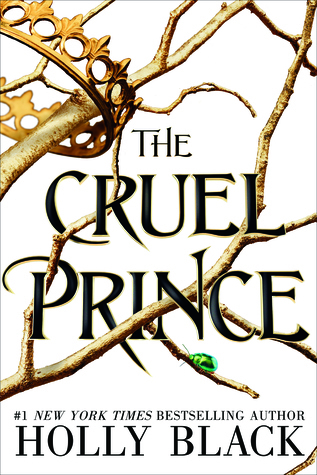 Cleverly plotted, The Cruel Prince stood out in a crowded YA Fantasy market because of the main character’s arc and also because it was smart and focused on more than world building (thought that was beautifully detailed). It was a story about finding/making your place amongst those who don't respect you, about making tough choices, about fearing and overcoming fear, about loyalty and family. Despite the fact that I guessed early on the turns the story took, I still thought it was a smart book. It made the main character, Jude, seem smart. Sure it reminded me a lot of Shonda Rhyme's Scandal, but in a good way. And though the TV series hasn’t been as stellar as it once was, I guess I can’t fault the writers’ intelligence and creativity when it comes to plotting intrigues and betrayals. The same can be said about Holly Black regarding The Cruel Prince. Jude is my kind of heroine. Lost at first, but desperate to find purpose. Badass with and without a sword. Clever and cunning. She's a no-white-hat (fans of the show will get the reference) and yet likable Olivia Pope. Jude is the Olivia Pope Shonda Rhymes wished she had written these past couple of seasons, because Jude managed to become the big player, the powerful one without turning into the person everyone hates. I can't go into details about how she gets there because of spoilers, but she is the one to fear now and I wholeheartedly approve! Now, I didn't care much for Jude's relationship with her twin sister, despite the interesting drama in the end. Nor did I care for the lackluster romance with Locke. But I loved the borderline absurd and extremely complex relationship between Jude and her "father"--the man who killed her real parents and kidnapped her into the fae world. Side note: despite my comparison to ACOTAR by Sarah J. Maas, The Cruel Prince presents a fae world much more complex and detailed, and also much darker. Anyway…Jude loved her “father”, just as much as she feared and hated him for who he was and what he'd done, and in the end, she almost became him. Once again, I have to compare that relationship with the one between Papa Pope and Olivia. The man is a monster who loves his daughter but will still does monstrous things to her. And the daughter fears and admires him while she travels down a path that will lead her to become him. It’s as dark and emotional as it sounds, and it’s what made this story so interesting to me. Since Jude was convinced Cardan hated her and was intent on destroying her, she ignored the signs that he wasn't as he seemed, but those signs were still there and they were many. I also adored how Jules acted/reacted when it came to him. For those worried that she'll turn into a love sick puppy because "Oh, Cardan is a prince and he's oh so pretty despite being so cruel", you have nothing to worry about. Jules is too smart for that. She knows better and she'll make Cardan work to get her forgivness. I’m already obviously Team Cruel Prince all the way, because what were the chances I’d resist a smirking, antihero hottie? The romance fan in me wished we'd seen more of Cardan and Jules' awesome dynamic in this book, but I'm betting we'll get plenty of that in the sequel. With everything that was going on in Jule's life, the hints of romance were left for the later chapters, and I was beyond ready for it. Again, spoilers will prevent me from saying much, but I can't complain that things are still unfinished and even more complex now, because that makes me desperate for book 2. Overall, The Cruel Prince was a stunning start to what I can see will become a favorite series, introducing a smart, complex and likable main character, a strong world, tons of intrigue and the hints of what will be a enemies-to-lovers, slow burn romance that will make my heart beat fast. Basically, it's a lot of what I wished I had seen in the past few seasons of Scandal, one of my favorite shows.